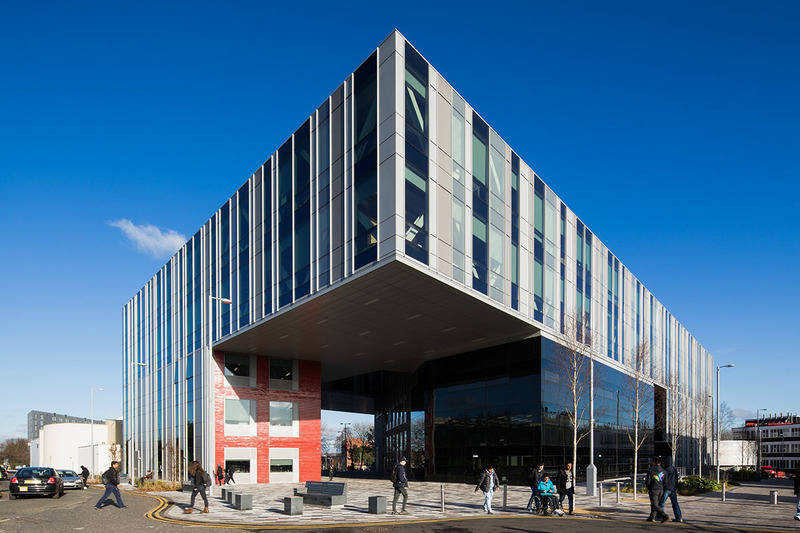 Originally known as the Gateway Building as it straddles a major walkway into campus, the Adelphi Building is home to the University of Salford’s music, performance, art, design and architecture students. Alucraft were appointed specialist façade sub-contractor by BAM Construction and were responsible for the design, development, testing, engineering, fabrication, logistics, delivery, co-ordination, installation and commissioning of all glazed façade elements. 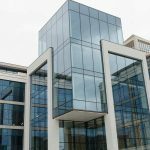 The scope of work included FW60+ Stick Curtain Wall with vertical V8 triangular cap and horizontal SG joints. The main innovative challenge for Alucraft on this project was the movement of the buildings super structure. The lower three floors are a concrete structure with the top two floors designed as a steel box truss structure, allowing large spans and cantilevers over the ‘gateway’ tunnel. This created two problems to overcome; the first was to separate the curtain wall between the two construction types, leaving enough room for movement, drainage and thermal expansion while at the same time maintaining as minimal a joint as possible, which also had to be flush with the façade. The second was retaining the semi SG units back to the aluminium framing under the large deflections in the single span 25m bridge and a 18m cantilevered corner. Once the exact deflections were known, Alucraft ran models of the glass racking which revealed areas within these zones requiring a larger joint and bespoke toggle. This allowed more flexibility in the IGUs for them to move and rack within the frame gridwork; which was vital for the Schueco FW60+ design to allow Stride Treglown’s architectural intent come to life. The building needed to appear as a unified structure. This requirement underpinned the development of a bespoke cladding system through collaboration with Schueco, as it had to perform under high levels of deflection. The building’s façade also had to integrate a naturally controlled ventilation system by way of automated AWS104 SG (panelled and glazed) vents connected and controlled by the BMS. Retained within the curtain wall were two different coloured aluminium insulated panels and a notable twenty-four alternate types of solar coated IGUs. Further to the main outer façade that wrapped the structure was an atrium rooflight with automated RO57 EN12101 certified roof AOVs as well as punch hole FW50+ stick curtain walling and ADS65 doors. If you would like more information on this or any other Williaam Cox products, or you would like to discuss your specific project requirements contact us today.